Around this time twenty years ago, I was on an airplane traveling to from Connecticut to Los Angeles on a day-trip (a day trip!) to meet with an important supplier to my company, Pratt & Whitney. I had just bought the book Lean Thinking a few days earlier (at an actual bookstore), and I read the book slowly and carefully on the long outbound flight, underling key passages and making copious notes in the margins. I reviewed my extensive mark-ups on the return flight and wrote down some new ideas. At the time I was new to Lean. I was a business unit manager in manufacturing and had my first experience with Shingijutsu-kaizen just two years earlier. The first kaizen was a “Wow!” experience, as were the others that followed. I was hooked on learning more about the Toyota Production System (TPS), also known as “lean production.” I found Lean Thinking to be inspiring, in part because of the chapter on Pratt & Whitney, which featured people that knew and had interacted with, and educational. The book resonated with me, but not for the usual manufacturing-related reasons. My interest was leadership, and I spent the prior five years reading all that I could to help me in my work as a leader at Pratt & Whitney. So when I read Lean Thinking, I was reading it through the lens of improving leadership for the Lean enterprise, not for improving production. (Read Taiichi Ohno’s book, Toyota Production System, through the lens of leadership, and you will be amazed at the new insights you gain). A year earlier I gave a presentation at a Pratt & Whitney operations leadership meeting where I described how to apply kaizen tools and methods to improving one’s leadership skills and capabilities. Click here to view the presentation. This was the start of Lean leadership as its own area of study and it led to my first paper on the topic titled “Continuous Personal Improvement,” published in early 1998. So while reading Lean Thinking, I got the idea to translate what I had learned into a new, more comprehensive model for leadership that went beyond what I had written in “Continuous Personal Improvement.” The model that I developed, inspired directly by Lean Thinking, was called “Lean Behaviors.” This became the title of my second paper on Lean leadership, published in late 1998. 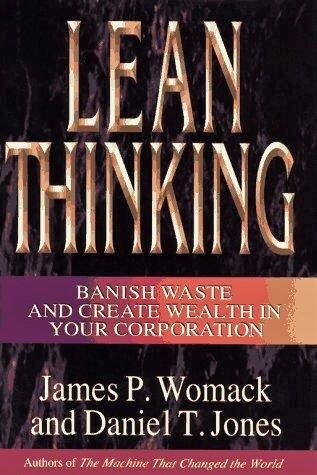 The five principles of Lean Thinking – “precisely specify value by specific product, identify the value stream for each product, make value flow without interruptions, let the customer pull value from the producer, and pursue perfection” (p. 10) – was the answer to two basic questions: “How do we do it?” and “What are the key principles to guide our action.” (p. 9) to go from Lean production to Lean enterprise. 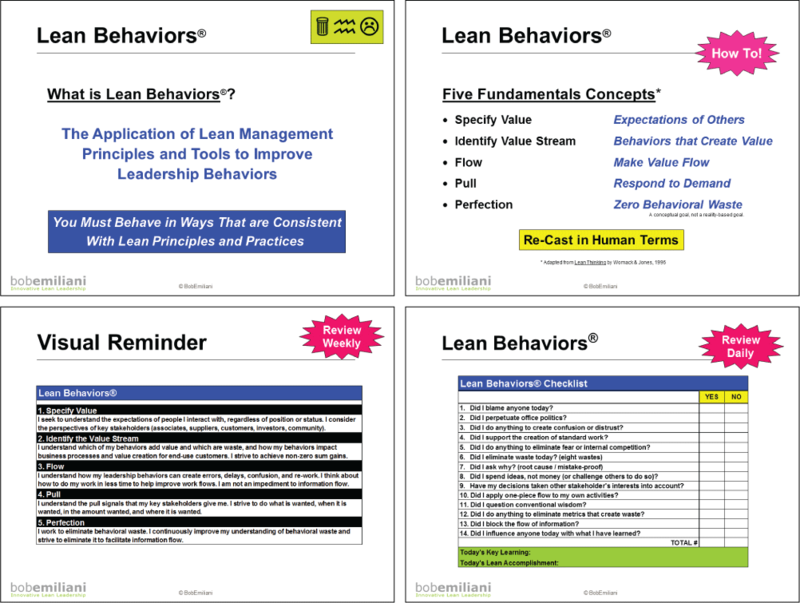 The paper, “Lean Behaviors,” applied the five principles of Lean Thinking to leadership, and I introduced the concept of “behavioral waste” (the eighth waste) – which I defined as “behaviors that add cost but do not add value.’ It was a simple, elegant solution to a vexing problem: “What is Lean leadership?” and “How do I become a Lean leader?” Many people told me these ideas of mine were a decade ahead of their time. Below are images that summarize how I translated Womack and Jones’ principles of Lean Thinking for products into principles for Lean leadership for people. The paper, “Lean Behaviors,” is much more detailed, but the slides below capture the essential elements. “Lean Behaviors,” won the outstanding paper award for the 1998 volume of Management Decision. The award was given to me in recognition of my innovative application of ideas from production management to leadership, and especially the practical utility of “Lean Behaviors.” You can easily see from the above slides that “Lean Behaviors” is practical, not theoretical. In 1999, I left industry for academia and continued my study of Lean leadership, which has resulted in more than a dozen books and 20 papers, which include abundant commentary and analysis on the critically important “Respect for People” principle. All of my writing is informed by my experiences in industry as a leader charged with practicing TPS in operations and in supply chains, and my continuing practice of Lean in higher education. It is also informed by my extensive reading beyond Lean Thinking. Specifically, the literature on progressive management dating back to the late 1800s, which reveals that most of yesterday’s difficult leadership problems remain with us today, and works by Toyota leaders and other hands-on practitioners. 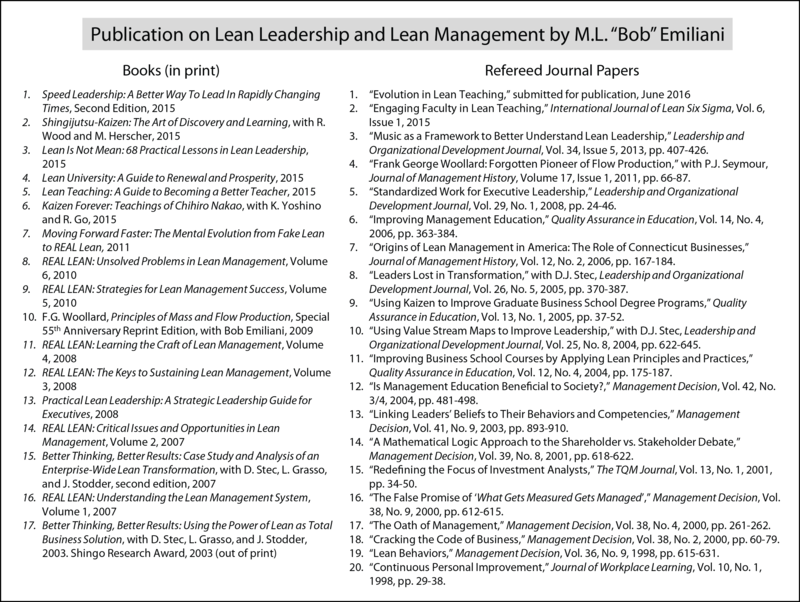 These later works make many more new contributions to the body of Lean knowledge and practice, in particular the linkages between beliefs, behaviors, and competencies of Lean leaders compared to conventional leaders. The contrast is remarkable, and goes far in helping us understand why effective Lean leadership is rare and what we can do to make it more common. You can learn about that, as well as Continuous Personal Improvement and Lean Behaviors, in my workbook, Practical Lean Leadership. It simply and elegantly aligns leadership practices with operating practices, so leaders need only to remember and do one thing instead of two. My most recent work, Speed Leadership, discards the old behavioral view of leadership and takes a new process view of leadership. This is truly innovative thinking that I hope you will want to learn more about. Click here to visit my Speed Leadership web site. Strangely, Womack (Lean Enterprise Institute) and Jones (Lean Enterprise Academy) do not recognize (or use) any of my work. The same is true for some other people who have made significant contributions to the body of Lean knowledge and practice. What’s up with that? I can associate to your last comment. I’ve had my approach (also Based on 25yrs practical experience around Europe and 15yrs of study into esoteric subjects) promoted as an advance in thinking by the likes of John Bicheno, and an ex colleague of Dr. Deming tell me I’d detailed what Deming was looking for in his SoPK… i’m still waiting to find the method that will allow me to provide my models to the masses. Hi David – Yeah, your work is excellent and deserves more recognition. I too like reading the esoteric subjects. It is truly helpful in connecting the dots. Dr. Bob, Thank you for sharing. I enjoy hearing about your journey. I like ‘Lean Thinking’ also, especially where the authors apologize for writing The Machine That Changed the World. They thought that TMTCW just made consultants rich doing benchmarking studies. The most impactful book in my lean development was ‘Becoming Lean’ by Liker. It was the first with the recipe and included a Pratt and Whitney case study. In their examples transformations started with the leadership first rationalizing manpower requirements after lean transformation and had a one time work force reduction making the announcement by committing that no one would lose their jobs due to improvement initiatives. It also demonstrated the leadership commitment to the transformation necessary for a successful outcome. Yes, the Becoming Lean book in 1997 was really helpful at the time and deeply discussed the role of leadership, management, and the need to view lean as a process of transformation or “becoming.” Add also the writing of K Suzaki in the 1980s – 90s when he fully described Toyota’s management and leadership. It is interesting to see how the masses adapt to the “next” thing. About 10 years ago, I started with a company which was using “Lean Thinking.” In my first two book studies/mastermind groups, I had two people dose off on me and I’m not that boring. We’ve seen the focus move to “coaching” now, which I believe to be highly relevant and yes I am a coach and a leaniac. Yet what most have failed to realize is that we work with people and people have behaviors and the association of those behaviors set in motion cultures. Lean or continuous improvement is much better done “with” people instead of “to” people. To that point, you kind of have to really be in the actual Gemba working with the people. We don’t view Gemba Walks or coaching as most. The goal is not to simply check data and make people report about it on the shop floor or office. The desired purpose is understanding the realities of the current state from those involved and approaching from a servant leadership and coaching aspect to support the team members involved. No books written here or multiple published articles or key notes, or maximizing Toyota or Deming or ??? Just a team working to get better every day, while adding value to others in a way that truly transforms the behaviors, team members and the organization. As my mentor, John Maxwell states, “Leadership is influence, nothing more and nothing less.” I believe a real Lean/CI Leader will be focused first on adding value. I surely agree with servant leadership and coaching at the genba. The genba is the truth. Maxwell’s definition of leadership, however, is a poor one like so many others. Why? Because criminal gang leaders have influence. So do business leaders who use their influence to win while simultaneously doing harm to others. Definitions of leadership that characterize good as well as bad are ambiguous and confusing. Leadership is up to everyone to determine how influence is used. If your a dad, mom, brother, sister, daughter, son, employee, manager, or if your simply breathing then some type of leadership is taking place because influence is taking place. Someone is watching and someone typically is following, regardless of the direction the “leading” is taking place. It might be bad, good or average. I didn’t, nor did Maxwell in this instance state what “good leadership” was but rather recognizes the fact that leadership influences. As an example, Oxford defines leadership as “the action of leading a group of people or an organization.” Pretty vague and doesn’t define good or bad. Right? Plenty of other resources by Maxwell and others supporting the servant leadership and coaching impact as you noted. Hi Rick – Definitely, we seem to be closely aligned. Thank you for buying the books. I hope you enjoyed them, and that they proved to be helpful to you on the genba. It’s just that in my Shignijutsu training, they taught me to be precise in language for the purpose of clear meaning.